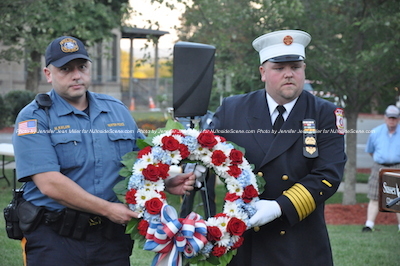 Newton Patrolman Mahir Kaylani (left) and Newton Fire Department's Jason Miller (right) carry the wreath in remembrance of 9/11 victims. Photo by Jennifer Jean Miller. 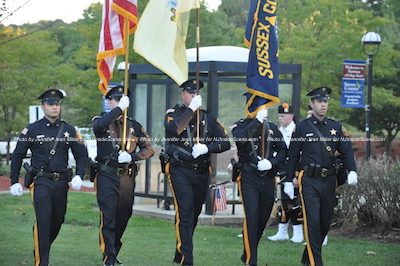 SUSSEX COUNTY, NJ – Sussex County marked the 14th anniversary of September 11, 2001, with the annual Sussex County Day of Service & Remembrance at Sussex County Community College on Friday, Sept. 11 at 6:30 p.m.
As dusk settled on the college green and the 9/11 Memorial with a beam from the World Trade Center, a group of county residents and dignitaries gathered for the solemn remembrance event. 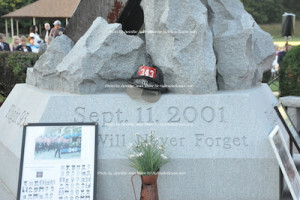 A helmet atop the memorial in honor of the victims. Photo by Jennifer Jean Miller. 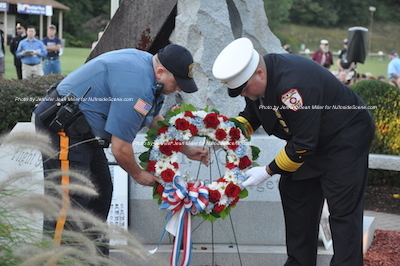 The Sussex County 9/11 Memorial. Photo by Jennifer Jean Miller. The memorial was dedicated in 2003, and since then, a number of prominent keynote speakers have taken the podium, including ABC News’s NJ Burkett, Gov. Chris Christie, and the Honorable Andrew P. Napolitano. 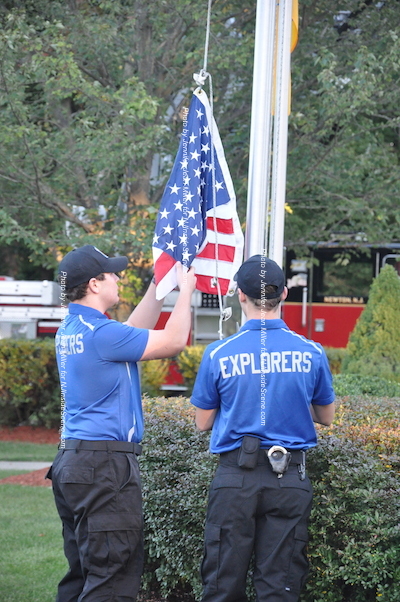 Police Explorers raise the flag. Photo by Jennifer Jean Miller. 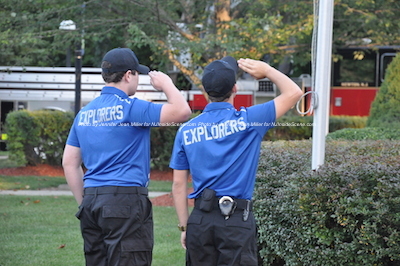 Police explorers salute the flag. Photo by Jennifer Jean Miller. This year’s speaker was the Hon. Lorraine Parker J.A.D. (retired). Judge Lorraine Parker, the keynote speaker. Photo by Jennifer Jean Miller. 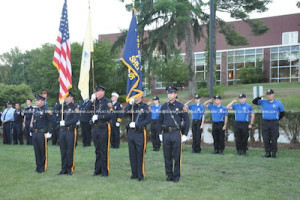 Sussex County PBA Local #138 organizes the annual event, in cooperation with Sussex County Community College. Each year, the touching ceremony includes a presentation of the colors, raising of the American Flag at half mast, musical tributes, wreath laying, and the lowering of the colors. 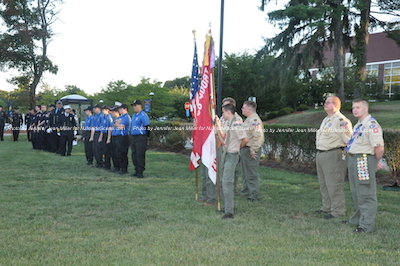 Boy Scout Troop 85, and the Sussex County Police Explorers at the event. Photo by Jennifer Jean Miller. A four-legged attendee at the event. Photo by Jennifer Jean Miller. Attendees at the ceremony on Friday. Photo by Jennifer Jean Miller. Byram Township Police Officer and PBA Local 138 Delegate Victor Marin was the Master of Ceremonies. Father S.T. 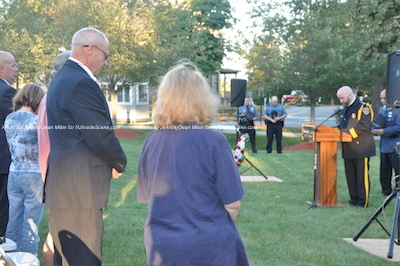 Sutton of Saint Joseph’s Church gave the invocation and benediction. The Sussex County Police Explorers raised the flag and led in the Pledge of Allegiance. 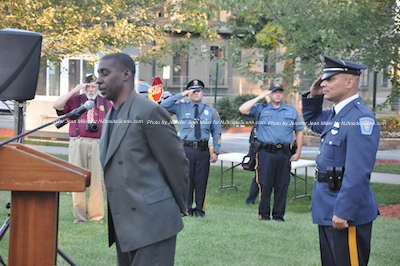 Retired Newton Police Officer Arthur Sibblies sang the National Anthem, with Kelly Wask of High Point Regional High School singing “God Bless America.” The Police Pipes and Drums of Morris County” marched to recessional music, plus performed “Amazing Grace,” with other groups alongside of the pipers including: the Sussex County Sheriff’s Department, the Sussex County Police Explorers and Boy Scout Troop 85. Arthur Sibblies, retired Newton Police Officer, sings the National Anthem. Photo by Jennifer Jean Miller. Kelly Wask sings “God Bless America.” Photo by Jennifer Jean Miller. 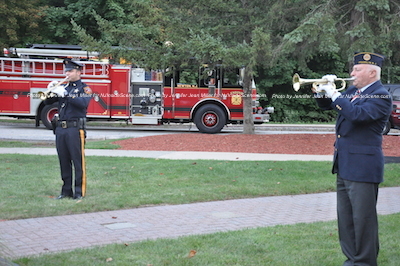 Marin introduced dignitaries who were present, including: Sussex County Freeholders Phil Crabb, George Graham, Gail Phoebus and Rich Vohden. 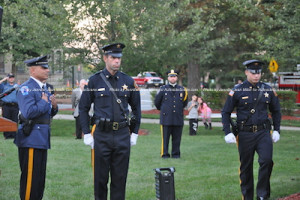 Prosecutor Francis Koch, and Captain Donald Peters of the Sussex County Prosecutor’s Office. 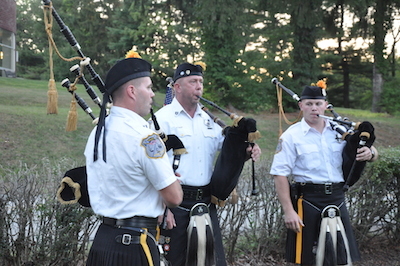 “Taps” concluded the ceremony. Photo by Jennifer Jean Miller. Parker said that she was in the appellate court in Morristown that morning, and was busy discussing cases, with no access to television or radio. She noticed the lawyers entering and exiting the courtroom more than usual. It was during a recess that she learned not only about the attacks, but that the buildings had collapsed. The Sussex County Sheriff’s Office Color Guard. Photo by Jennifer Jean Miller. Parker had worked in the city for a time, taking the PATH each morning. 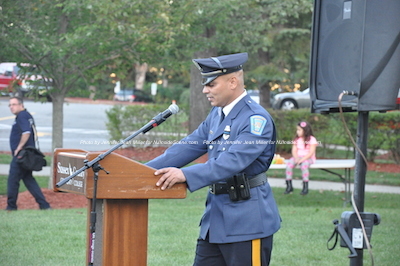 Victor Marin, Master of Ceremonies. Photo by Jennifer Jean Miller. 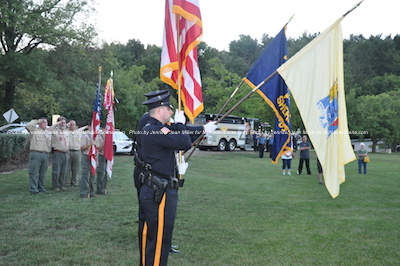 The Sussex County Sheriff’s Office Color Guard marches in. Photo by Jennifer Jean Miller. 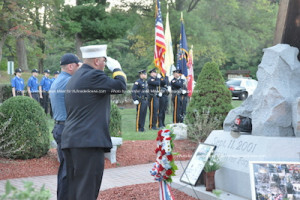 Parker’s brother-in-law, who worked for the New York City Fire Department, and her brother for the MTA, both responded to the rubble for weeks, she said, and are still monitored for possible health effects for their weeks at Ground Zero. “Now more than ever we must keep our democracy strong,” she said. 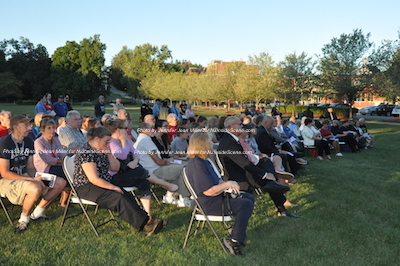 She emphasized the importance of teaching young people, with many at the college where she is on the Board of Trustees, who are now entering as freshmen, only four years old at the time of the attacks. 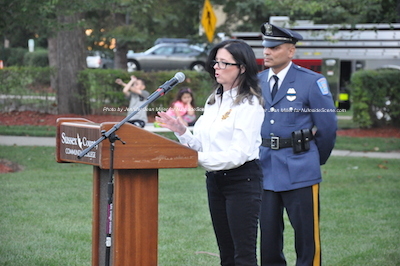 Gail Marie Kelly speaks about her brother, who perished in the terrorist attacks. Photo by Jennifer Jean Miller. 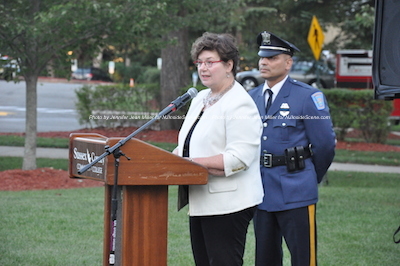 A speaker not on the program who was invited to the podium, was Gail Marie Kelly. Kelly’s brother John Edward Bulaga, Jr. was an employee of Cantor Fitzgerald on 9/11, and perished at the towers at the age of 35. He was employed there as a network administrator in the company’s eSpeed division. The Sussex County Sheriff’s Office Color Guard and the Sussex County Police Explorers. Photo by Jennifer Jean Miller. She described her brother “Johnny” as an “80s guy,” who embraced the music and the style of that time, and recounted that he could do a perfect cartwheel and split, though he was of a larger stature. He was an ardent fan of Star Trek, and enjoyed all things technological. He married his wife, Michelle, and had two daughters, Rhiannon and Alannah. 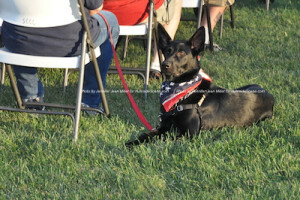 He and Michelle were in the works with closing on their first home that Friday before the attacks. The American Flag is draped over the memorial from Newton’s Tower Truck. Photo by Jennifer Jean Miller. 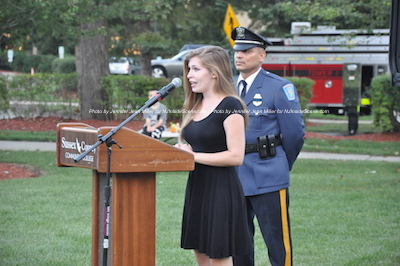 Kelly noted that her niece Rhiannon was presented with a scholarship to Rowan University, for children that lost a parent in 9/11. However, Rhiannon refused the scholarship, her wish that it could be given to another student, who may have lost both parents. “Don’t you ever forget,” she told the audience. She recalled one political leader who told a 9/11 family members to step down at an event, an action that she said was wrong. Patrolman Mahir Kaylani (left) and Newton Fire Chief Jason Miller (right) place the wreath at the foot of the memorial. Photo by Jennifer Jean Miller. Patrolman Mahir Kaylani (left) and Newton Fire Chief Jason Miller (right) salute after placing the wreath at the foot of the memorial. Photo by Jennifer Jean Miller. Saluting the wreath. Photo by Jennifer Jean Miller. In his benediction, Father S.T. Sutton reiterated to the attendees to remember the victims, noting that the first one recorded was a priest, New York City Fire Department Chaplain Mychal Judge. 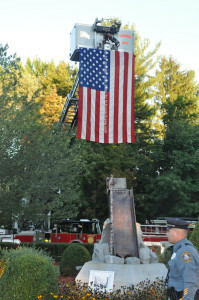 Judge was in the North Tower that morning, responding with other firefighters, to offer support in the situation. Judge was known for his kind heart, and was often viewed as a friend to each life that he touched in the department. 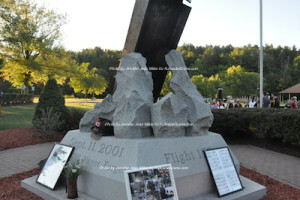 When the South Tower collapsed, Judge was hit with debris, and was found dead. Father S.T. Sutton at the podium. Photo by Jennifer Jean Miller. 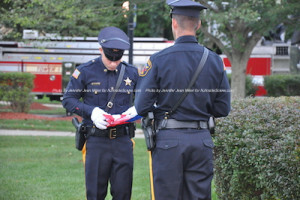 Images later flashed around the world of Judge as fellow first responders carried him out from the cloud of dust on a chair. His death certificate was the first issued from the city, as Sutton noted, marked with a number one. Pipers at the service. Photo by Jennifer Jean Miller. 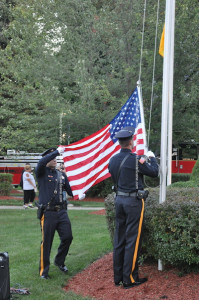 Officers lower the flag. Photo by Jennifer Jean Miller. The flag is folded. Photo by Jennifer Jean Miller. 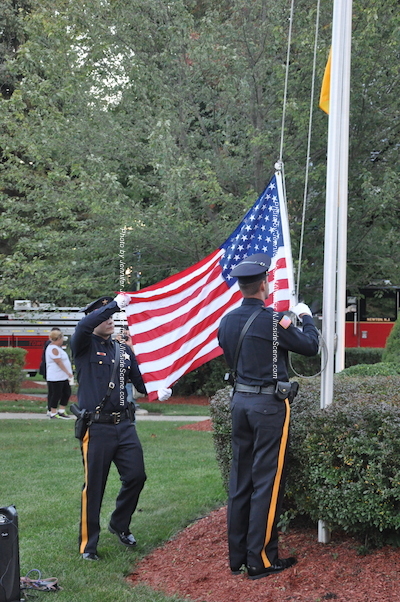 Victor Marin is presented the flag. Photo by Jennifer Jean Miller. 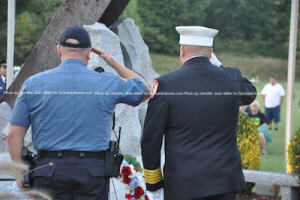 Those who knew Judge often say his role as the first was to spiritually carry the others who had perished that day as they crossed over, which his role just before his death was to lend comfort and pray for firefighters who were suffering mortal injuries that unfortunate morning.